I wasn't totally in love with my Marchesa Ombre inspired nail that I did a couple days ago, so I decided to do another one. So today's nail art is again from Gossip Girl and again it's worn by favorite character Blair Waldorf. The Floral Bustier dress is from Louis Vuitton Resort 2011 collection and it was featured in Season 5 episode "The Jewel of Denial". I picked this design just because it looked fairly easy to do and I had all the colours too. Although it was easy to replicate, it took a little bit longer than I thought because of all the little teeny tiny details. Paint on your usual base coat and allow it to dry. With the dotter tool, use the larger end and create various sizes of white lumpy circles and ovals to replicate flower petals. Next use the smaller end of the dotter tool and dab it in Silver polish and add shading and petal outlines to the white flowers. Tip: Zoom in on the dress and use it as your guide on where to add the shading. Use a striper or fine nail brush, dip it in black polish and add in the disk center. Try to make small thick "c" or "E" shapes. Use the smaller end of the dotter tool, randomly place 3 or 4 varying sizes of electric blue dots in between the white flowers. Do the same thing with the forest green. Using the striper, dip it in a darker blue nail polish and outline half of the the blue dots to add shading. Then use the smaller end of the dotter tool, place small dots within the blue circles to create the additional "highlight". 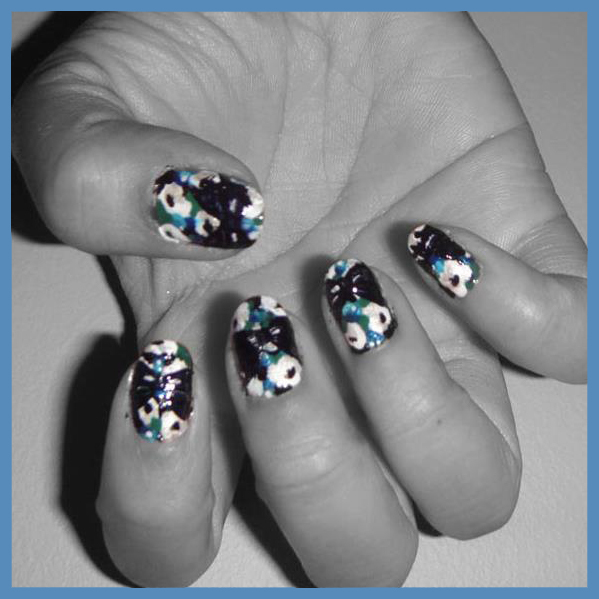 With the striper fill in any of the uncoloured area of your nail and outline some of the petals so the flowers have a sharper edge. 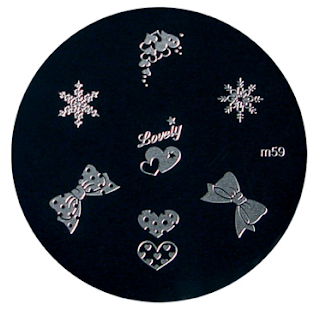 With the M59 Konad image plate, fill the solid bow image with Konad special black nail polish, scrape the excess and transfer the image near the top of the nail. Optional Step: Dip the striper tool in black nail polish and outline the edges of the bow. Finish your artwork with a top coat.